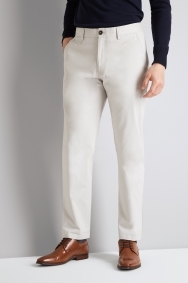 Brighten up your smart casual wear with these chinos. 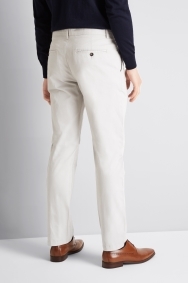 The clean stone colour of these chinos will go with anything and bring a light brightness to your look. They’re a versatile item to own thanks to their blend of smart and casual, and the tailored fit cut has the sharpness you need for dressier days. Made from a blend of 98% cotton with 2% elastane, they’re both comfortable and close-fitting for easy-to-wear definition. Offset the neutral stone with a bold colour in your shirt and be brave with pattern to turn heads. There’s no need to wear a belt, and you can choose any pair of tan shoes to bring richness to your outfit. Looks smart, fits well, servicable. The suite was a perfect colour and fit. Same as the navy pair i bought. Right fit for me. Very nice looking. The material ensures any minor particles can be wiped off to maintain the clean sandstone colour. Looked good. Nice cut. Comfortable. Really great service as always.